An official Battlefield World Premiere page has appeared on the EA/DICE Battlefield.com website with a countdown timer ticking away. At the time of writing there are four and a half days left until we see/hear/read an official announcement concerning the next game in the Battlefield series, expected to be called Battlefield 5. As a pre-announcement of an announcement we don't have much news for you on Battlefield 5 at the moment. Last December we first heard that DICE had started work on Battlefield 5 after completing all the Star Wars: Battlefront and DLC work. More interestingly, in February we heard rumours, via a retailer slip-up, that Battlefield 5 would be set in the Great War, the First World War, WWI. The same retailer published a release date of 26th October 2016. 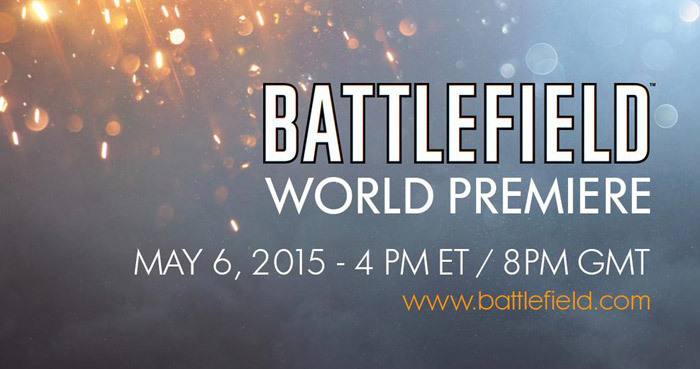 Those interested are invited to follow Battlefield on Twitch to see the announcement as it happens (4pm ET / 9pm BST on 6th May 2016). At the end of March we heard that the next Call of Duty game would be set in outer space. Now there has been both an official teaser trailer, and a full reveal trailer, published by Activision. In the official, purposely jittery, teaser trailer 'Know Your Enemy', an angry space captain promises to "rip you from the history books" only later to "build monuments to your destruction" – he's just making work for himself there. This morning Activision officially published the widely leaked full reveal trailer. I've embedded the reveal trailer video below for your convenience. To summarise the above video; Call of Duty: Infinite Warfare is indeed an interplanetary war game. It is said to be a "gripping war story in which players fight against the Settlement Defence Front to defend our very way of life" after a surprise attack. In the video we see ground combat, that looks like it is set on a futuristic planet Earth, and fighters blasting off from Earth into space to dog fight against enemy space ships, later we see them board enemy ships and venture onto alien moons and planets to battle the enemy. Call of Duty: Infinite Warfare launches on 4th November 2016 on PCs and consoles. You can pre-order the Legacy Edition or Digital Deluxe Edition and get the Call of Duty: Modern Warfare Remastered edition for free. What I'm more interested in, and what they seem to be keeping tight lipped on, is the cod4 remaster. Could potentially be good, but from what we've seen from canadian promotion material, it includes the campaign but only 10 of the 20 (21 if you count winter crash) multiplayer maps. No word as to whether its coming to PC either, as always. Personally think they're just gonna port the game to the new consoles relatively untouched but we'll see. Edit: Oh, watched the trailer, cod4 remaster looks atleast a little touched up, not massively different, and they used wetwork which is probably the darkest least distinguishable map possible, but it looks like they're atleast doing something with it. Nvidia is apparently going to unveil the GTX1080 and GTX1070 at the event. Call of Duty: Infinite Warfare press release published.